Open a book. Tap the book you want to read. If you don’t see it in the Library, swipe left or right to see other collections. Show the controls. Tap near the center of a page. Not all books have the same controls, but some of the things you can do include searching, viewing the table of contents, and sharing what you’re reading. Enlarge an image. Double-tap the image. In some books, touch and hold to display a magnifying glass you can use to view an image. Go to a specific page. Use the page navigation controls at the bottom of the screen. Or, tap and enter a page number, then tap the page number in the search results. Get a definition. Double-tap a word, then tap Define in the menu that appears. Definitions aren’t available for all languages. Remember your place. Tap to add a bookmark, or tap again to remove it. 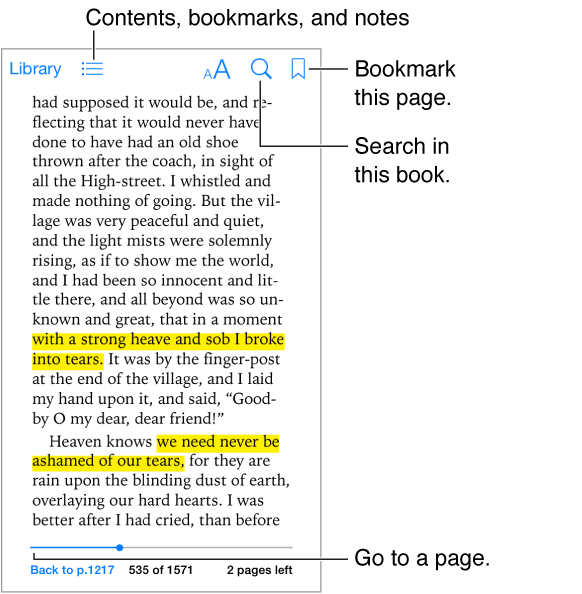 You don’t need to add a bookmark when you close the book, because iBooks remembers where you left off. You can have multiple bookmarks—to see them all, tap , then tap Bookmarks. Remember the good parts. Some books let you add notes and highlights. 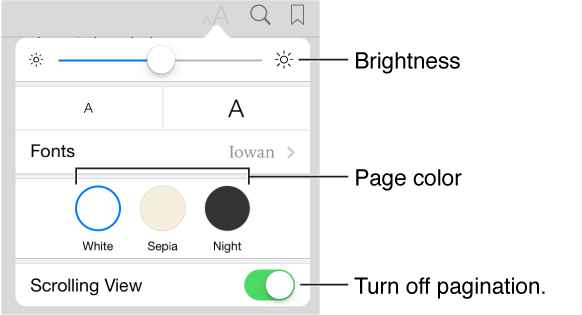 Double-tap a word to select it, move the grab points to adjust the selection, then tap Note or Highlight in the menu that appears. To see all the notes and highlights you’ve made, tap , then tap Notes. Share the good parts. Tap some highlighted text, then tap . If the book is from the iBooks Store, a link to the book is included automatically. Share a link to a book. Tap near the center of a page to display the controls, then tap . Tap , then tap Share Book. Change the way a book looks. Some books let you change the font, font size, and color of the page. Tap . You can change justification and hyphenation in Settings > iBooks. These settings apply to all books that support them. Change the brightness. Tap . If you don’t see , tap first.